Hasty expansion, faculty shortage and falling student standards are taking the sheen off India's best engineering brand. Nitin Kumar Reddy came across as a chilled-out guy. He was nerdy, yet jovial. His friends at the Indian Institute of Technology (IIT) Madras, where he was studying mechanical engineering, called him FireStallion. Every day, he would download hard to find movies and share them over the local computer network that connects all students at the IIT. And just for fun, he once spent 14 hours without a break building a large crane using Lego blocks. "I'm awesome," he wrote on his profile page on a social networking site. One hot muggy afternoon in May 2011, Reddy locked the door of his third-floor hostel room from within and hanged himself from the ceiling fan. IIT Madras, where 8,000 students and 530 teachers share a 620-acre campus with 400 species of plants, blackbucks, fan-throated lizards, tortoises and venomous cobras, was rattled. Reddy, a final-year M.Tech student was behind schedule on a project, and had been asked to stay back another six months to complete the work, while everybody else in his department graduated. Perhaps, Reddy was not able to cope with the academic pressure, or the shame of staying back at the institute was too much. Or he was upset that he had to let go a plum job he had landed. Whatever the reason, the 24-year-old's suicide is a cursor to an epidemic across all IITs. According to the government, 10 IIT students have killed themselves since 2010 - there were two suicides each in IIT Madras and Kharagpur and one each in IIT Kanpur and Delhi in 2011 alone. And a government taskforce found 18 attempted suicides in the last two years in the centrally-funded technical institutions. All is not well with the IITs, the country's finest technical education chain to which millions of youngsters have aspired since the 1950s. In 2012, a record 479,651 candidates appeared for the Joint Entrance Exam, or JEE, for 9,647 undergraduate seats. And, when this year's JEE wraps up in June, the number is likely to have crossed half a million. But over the years, the JEE, well-known for its tough standards, has developed loopholes that may let smart, but not necessarily the best, brains in the country into IITs. This, at a time when competing global engineering schools such as Singapore's Nanyang Technological University, Hong Kong University of Science and Technology, Tsinghua University, Beijing, and Korea Advanced Institute of Sicence and Technology have popped up into global prominence. Much of this is because of the scorching pace at which IITs have expanded over the last five years. Still, there is no denying the erosion in the quality of output of the IITs --- at least, relatively speaking --- and what it does to the famed Brand IIT, which played a role in changing India's image from a "nation of snake charmers" to a "nation of (computer) mice". Is Brand IIT killing itself? The number of IITs now totals 16. Nine of them came in or after 2008. The result has been a split in how IITs are perceived. The new IITs at Bhubaneshwar, Gandhinagar, Hyderabad, Jodhpur, Ropar, Patna, Indore and Mandi, some professors and recruiters say, are not quite IITs the way the world expects them to be. "Employers clearly understand the difference between old IITs (Kharagpur, Bombay, Madras, Kanpur, Delhi) and the new ones. There are the old ones, the intermediate ones like Roorkee and Guwahati, and the new kids on the block," a senior professor of the Computer Science Department in IIT Delhi, who didn't want to be identified, says. "The old IITs still have the same value as they did earlier but you can't say you are from IIT. You have to say which one you are from," he adds. That is a view resonating widely among IIT's alumni across the world. "Until now, an IIT meant something, now there is a distinction based on what follows 'IIT' --- as in the location," says San Francisco serial entrepreneur and IIT Kharagpur alumnus Indra Singhal. That distinction has slowly eroded the way the world perceives the IITs. 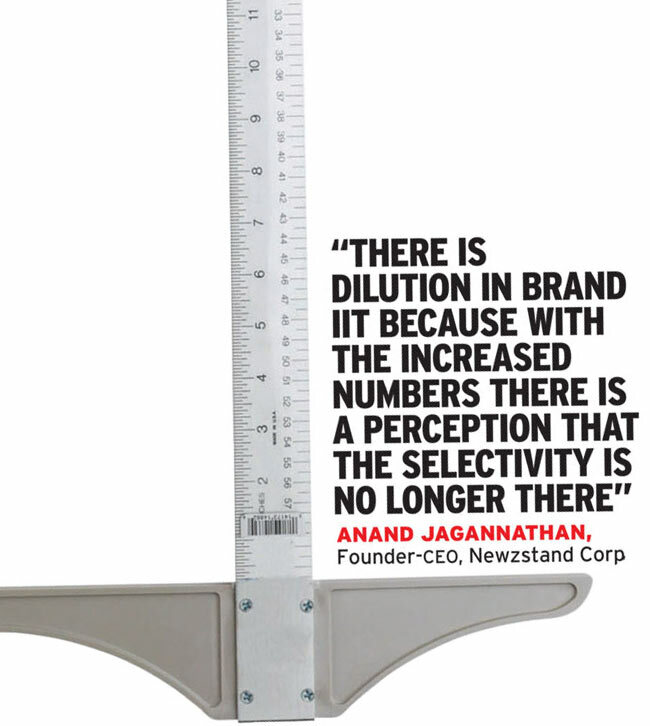 "There is a dilution in Brand IIT because with the increased numbers, there is a perception that the selectivity is no longer there," seconds Anand Jagannathan Founder-CEO at Newzstand Corp, also in California, and an IIT Kanpur alumnus of 1974. That is not an emotional argument from a bunch of people bent on preserving IIT's elitist tag. The reason employers want to differentiate is because of quality - the new IITs, mostly located in smaller cities and towns, have not been able to attract good faculty. Neither are their facilities at par with the older ones. Ask Intel. Every year, the world's biggest chipmaker hires about 150 engineers from campuses in India with specialised skills in areas such as power management - mostly from the IITs. Apreeta Singh, Senior Manager of Talent Delivery at the company says she only goes to the top four old IITs. "We don't go to the new IITs because there definitely is a difference in the quality of students. And these IITs don't have the brand name.," she says. "Even other MNCs would not want to go to new IITs." Nobody doubts that India needs more quality engineering institutes. The country mints about 600,000 engineers every year and counts about four million students in its engineering colleges but employability is a critical issue. Different surveys say just one in four engineers in India can be ushered into a job, and that too after training. Only 17.45 per cent of engineers are employable in the IT services sector and just 2.68 per cent in IT product companies, a study by talent assessment company Aspiring Minds concluded in 2011. Engineering companies fall somewhere in between and make one hire from 20 candidates, says Varun Aggarwal, co-founder of Aspiring Minds. India, reckons Mohandas Pai, the former HR chief of Infosys, needs around 400,000 engineers a year. While a higher number of IITs in dispersed locations can help increase the supply of quality engineering talent in the future, the kind of quality educationists are looking for remains elusive. One way to raise the bar on quality of education at the new IITs would be to bring in top notch faculty but that is easier preached than done. A typical IIT assistant professor starts at about Rs 75,000 a month - less than what many engineers from Tier II colleges get as their first pay cheque. Says Ashok Misra, a former director of IIT Bombay and now the Chairman of the JEE Council, "People go for teaching because of their passion for it. But if your colleagues working in corporate offices get four times your salary, it does affect your teaching." But with government rules on compensation in operation at the IITs, there is little they can do to raise faculty salaries. The irony is that even trainers in some JEE coaching centres make six times as much, if not more. IIT administrators hold that attracting good faculty will continue to remain a challenge for institutes located in places like Ropar, Jodhpur, Gandhinagar and Mandi because of what they call a "two-body" problem - both the husband and wife want to work and that may not be feasible in a smaller location. "This was not a problem in the previous generation when one spouse was a homemaker," says Bhaskar Ramamurthi, director of IIT Madras. IIT Kharagpur, a sleepy town with a large railway workshop and an Anglo-Indian heritage, easily flourished, having started in 1951. But IIT Mandi, Himachal Pradesh, in comparison, which according to a board member of the institute has a "wow campus" being located in the hills, has only 22 teachers of a sanctioned strength of 90. So why set up IITs in remote places? "That is a good question," Ramamurthi snaps. There are no easy answers. The political undertones of the expansion in the number of IITs is unmistakable. Most of the new IITs began in 2008 and were announced by the late Minister of Human Resource Development Arjun Singh on March 28, 2008 as Congress insiders were betting on a wave of welfare measures to bring them back to power. A year later, in the 2009 general elections, the Congress emerged as the single largest party and formed the second United Progressive Alliance government. To be sure, it was not the new IITs' decision that helped Congress at the hustings. Academics say that if at all they had to be set up, the new IITs should have been spaced out - say, one every five years, or even one every two years. "That would have been easier on the system. But the timing and locations were political decisions. In the long-term, these IITs will become good," Dheeraj Sanghi, Dean of Academic Affairs at IIT Kanpur, says hopefully. Tall and lean, Krishna P. Jagannathan moves around the IIT Madras campus in smart sunglasses. A 2004 B. Tech graduate from the IIT, he went on to do his Ph.D from MIT before coming back to join his alma mater as an assistant professor in the Electrical Engineering department. Soon, he will be in Italy and Japan presenting conference papers on wireless networks. In the one and a half years he has been at the IIT as a professor, he has already published his research work in two journals, besides readying two conference papers. Jagannathan's research output is a slight improvement by IIT Madras standards of a decade ago. In 2002/2003, publications per faculty member a year at the IIT stood at 1.23, according to an IIT review committee report of 2004, chaired by noted scientist P. Rama Rao. In other IITs, it varied between 1.03 and 1.69. In 2011/12, the output by professors at IIT Madras jumped to 2.05. IIT Bombay has hired 100 people from abroad since March 2010. And IIT Madras' intake of such faculty has been about 30 a year. The thrust towards research is in one way aimed at countering the faculty shortage. 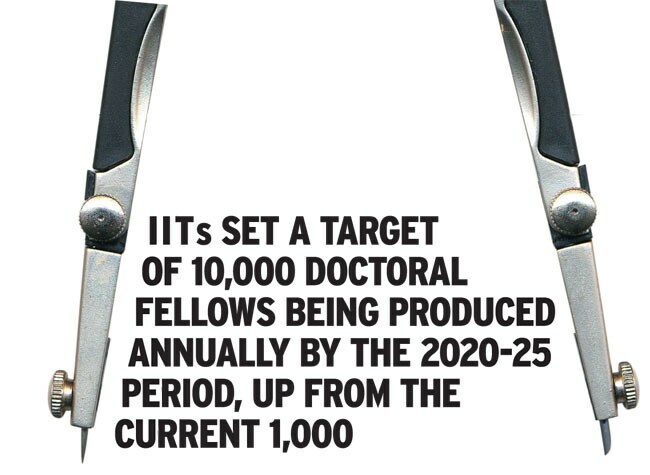 The Anil Kakodkar Committee of 2010 in its strategic recommendations for IITs set a target of 10,000 doctoral fellows being produced annually by the 2020-25 period, up from the current 1,000. The hope is that some of these Ph.Ds will stay to teach at the IITs. Today, faculty at the IITs is far behind the ideal number needed to do a good job of teaching -the teacher-student ratio in the older IITs are trending at 1:16 while ideally it should be 1:10. 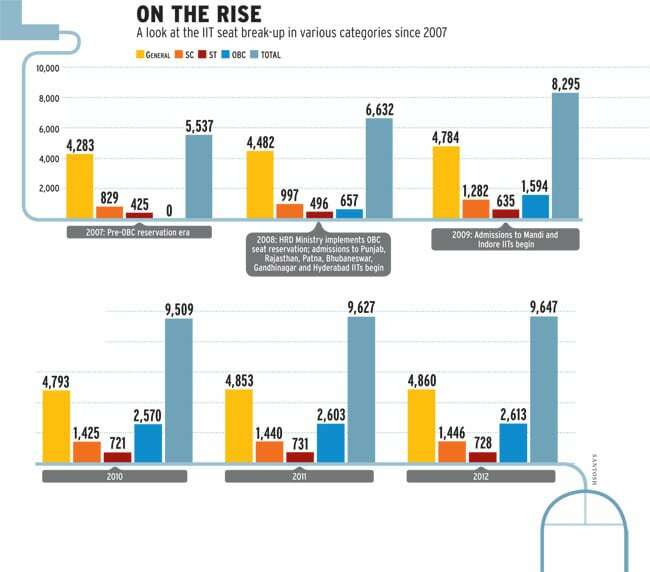 Quality recruitments have simply not kept pace with the sudden expansion in the number of seats. In 2007, IITs had 5,537 seats. This jumped 74 per cent to 9,647 by 2012, with most of the expansion happening in the reserved categories as the Ministry of Human Resources and Development implemented 27 per cent reservation for the Other Backward Classes (OBCs) in 2008. "People believe that there has been dilution in quality. That is expected because you have admitted 50 per cent more people today," says Krishnan Balasubramanian, Professor in the Department of Mechanical Engineering at IIT Madras. The problem of teacher shortage is compounded by the fact that many students feel disillusioned with some of the older professors who continue to teach from 20-year-old notes and have not upgraded themselves with the changing times. Textbooks, however, are reviewed by some of the IITs every three years. Armin Mustafa, an IIT Kanpur post-graduate from 2010, now works with Samsung. She says she was lucky to have a good teacher. "But in the IIT there were two-three professors who did not teach much. They took half the classes in a semester. They were either on leave or just absent," she says. A recent survey carried out by a student group at IIT Bombay - incidentally, the preferred destination of top JEE qualifiers (in 2011, 70 of the top 100 JEE qualifiers went to IIT, Bombay) -- is revealing. In an article headlined 'Why don't we study at IIT-B?' published in its student magazine InsIghT, the authors write: "Surveys among our students have consistently shown them to be unhappy with the teaching at IIT-B. 88 per cent of the respondents feel that one of the important factors why they don't study is because the professors haven't succeeded in generating enough interest in their courses. 72 per cent of the respondents also blame the course content for being too theoretical and lacking an application perspective making it disinteresting." Nidhi Shanbagh, one of the students involved in the survey says that students are not questioning the capability of professors. "We just wanted to see if the teaching can be made more interesting so that we study more. We are not putting enough hours into study," she told BT. The same survey raises another important issue. As IITs try and transition to being institutes of research, teachers are perhaps spending more time in research than in teaching. "Research is the most important factor in faculty recruitment as well as promotion, although course evaluation is also a component. It's not hard to see why it is possible that research could be more interesting while teaching could be relegated to being one of the unpleasant aspects of the job, for many professors," the article states. The issue of teaching quality is relevant in other IITs as well. A professor from IIT Kanpur who did not want to be quoted says that there has been a decline in the quality of courses. "Twenty five years ago, teachers gave out assignments to students every week and these were graded and returned. Today, they can't give out assignments because grading them will take more time," he says, adding that "Class sizes are much larger now and there is no personal connect with the student". Harish Hande, co-founder of sustainable energy company SELCO Solar also graduated from IIT Kharagpur in 1990. He holds IITs are not teaching coursework relevant to India and the faculty still have an elitist bent of mind. "IIT students are the classic product of subsidies and have created jobs and innovations for America. There is hardly a connect between IIT and rural India. Industrial Training Institutes (government-run technical training organisations) have had more impact on rural India - students from these institutes made, installed and maintained pumps that have helped in the agri revolution, for example," Hande says. While coursework seems adrift, there is a growing view among that IITs may well be admitting less meritorious students given the huge expansion in the number of reserved category seats. It is a touchy issue and most professors shy away from talking about the quality of reserved category candidates. But it is obvious everybody is worried about the disparity in a class - the Kakodkar Committee conducted an online survey inviting inputs from all stakeholders (including students and teachers) on the IIT system. A large majority suggested periodic review of the structure and pattern of the JEE to ensure true quality and cautioned against expansion at the expense of quality. "There is no significant difference between general category candidates and OBCs," says a professor with an administrative role in one of the IITs. "But some of the other caste students, particularly those who come from Hindi medium, have difficulty following lectures." The medium of instruction in the IITs is English. "They have major problems in the first year but are counselled not to lose confidence. The average pass out grade in four years is 7.3. 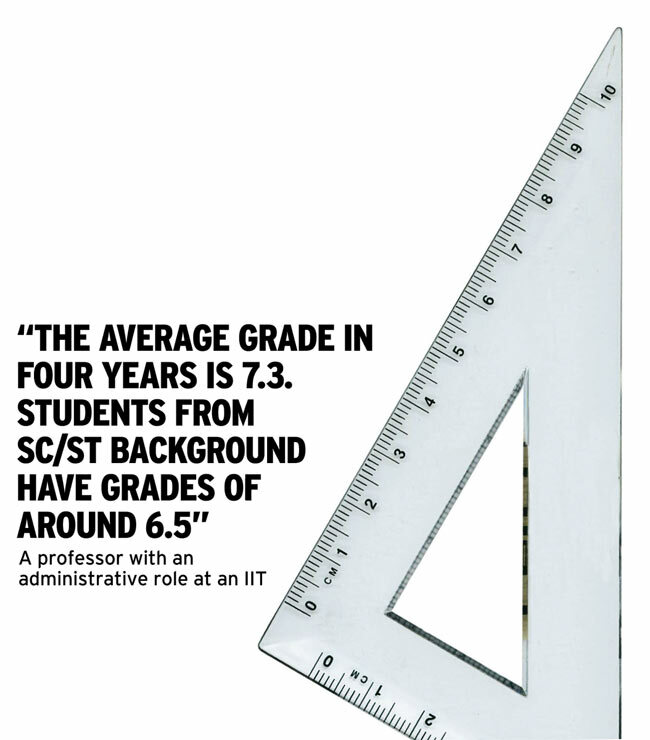 Students from SC/ST background have grades of around 6.5," he adds. The other trend is of students laser-focused on careers these days. The perception of quality changing has to do with cultural change, says the II T Delhi computer sciences professor quoted without naming earlier. "Twenty years ago, there were brilliant people who had no career ambition. They did crazy things, smoked grass, cracked exams," he says. "Today, everyone has a career path decided from the day he or she enters IIT." The current JEE system has problems that might be leaving out truly bright students and admitting just the smarter ones for undergraduate courses. Entrance exam coaching, professors say, makes candidates smarter at cracking the JEE. 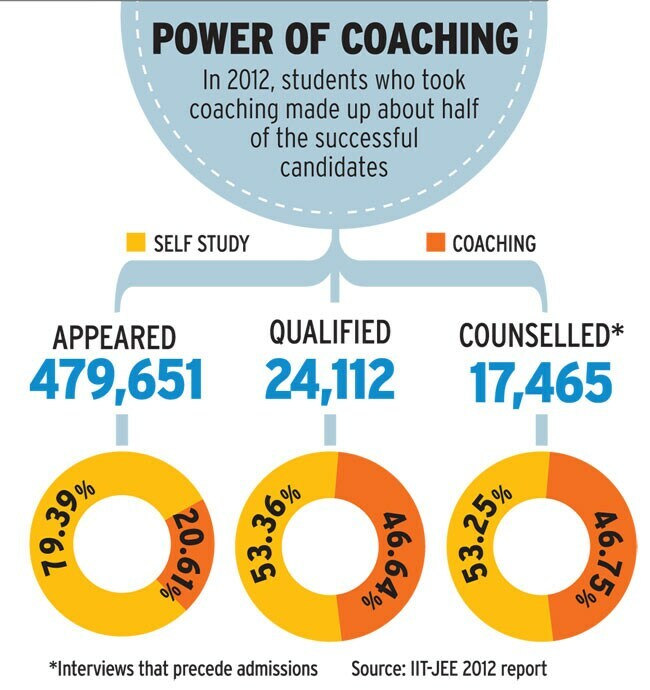 According to a JEE report, one in five registered students took coaching help during JEE 2012 but they made up about half of the successful candidates. "We are getting good students. Whether we are getting the best students is difficult to say in an elimination exam with this ratio. Somebody who is very good but didn't get coaching and didn't know the strategy of time management may lose out to somebody who does not have that spark. 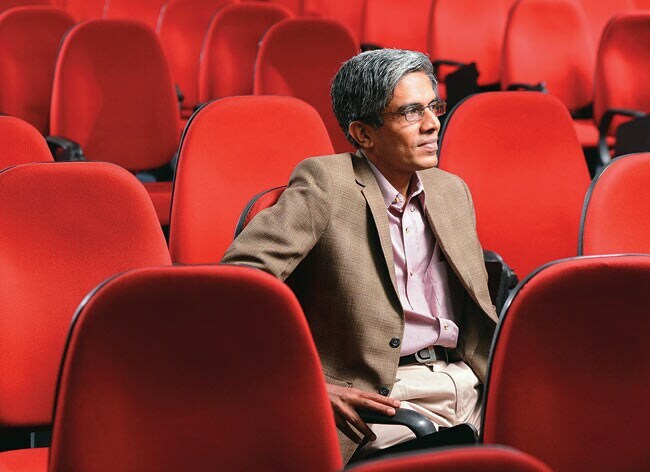 It could be matter of a few marks," Ramamurthi, the IIT Madras director, acknowledges, and hastens to add, "If I have gone for coaching, I am taught how to decide when a question is beyond my capability and move on. But the instinct of any bright student is to 'let me take this up and do it'. He may waste too much time on a question." Strangely, IITs alone has been responsible for the growth of the coaching industry in many ways. The JEE earlier made candidates go through a multiple-choice screening exam followed by a problem-solving exam where answers were graded by humans. But with growing volumes, such grading became difficult. How does this distortion reflect on the campus? Students have become less serious about coursework. "People believe that there has been a dilution in quality. That is expected because you have admitted 50 per cent more people today," says Krishnan Balasubramanian, professor at the Department Of Mechanical Engineering at IIT Madras. He joined the IIT 13 years ago and cites an example of how he has seen a change in student motivation towards academics. "In the first six-seven years of my tenure, we got at least 5-10 students publishing papers every year from my department at the undergraduate level. Today, I have great difficulty in finding a single student who wants to do it at that level." IIT students are also becoming less nerdy, it seems. The survey by InsIghT, the IIT Bombay student magazine, says that 75 per cent of the students at the IIT don't spend any time on academics if there are no upcoming assignments and 80 per cent of students study less than three hours a week. IIT Madras has been shutting Internet connectivity during some hours of the night to encourage students to sleep. In the middle of all these, some recruiters and academics feel that the gap between IITs and some of the second-tier engineering institutions has narrowed. P. Anandan, Managing Director of Microsoft Research India asserts that IITs are not any worse than they were 15 years back. But in the same breath, he rates Indraprastha Institute of Information Technology, Delhi (IIIT-Delhi), which was created as a State University by an act of Delhi Government in 2008, in the same league as the IITs. He insists others such as International Institute of Information technology in Hyderabad are also in that league. Vineet Kaul, the Chief People Officer at metals company Hindalco Industries Ltd and the former HR head of Philips, does not recruit from IITs but has experience of recruiting from these institutes in his previous company. "Our experience with the National Institutes of Technology has been good at Hindalco. The students offer us quality and stability. 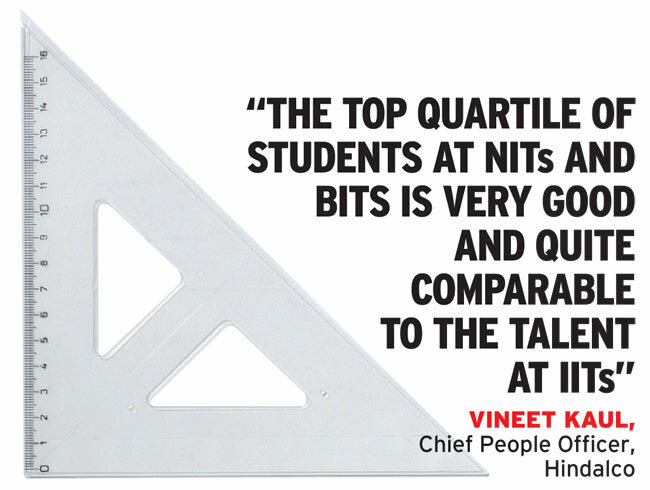 The top quartile of the students at NITs and BITS are very good and quite comparable to talent at the IITs," he stresses. Arjun Malhotra, who co-founded HCL Technologies along with Shiv Nadar back in the 1970s and more recently, was the Chairman and CEO of IT services company Headstrong, says there are departments in some NITs that match IIT standards. He cites the example of the Computer Science Department at NIT Surathkal. If the IITs don't pull up their socks, they will soon face much tougher competition from both Indian colleges on one hand and international universities on the other. With all the chest-thumping in India about being premier, IITs don't figure in the list of top 200 universities in the world. As per QS World University Rankings 2012/13, which evaluates 700 universities in the world, the best rank was of IIT Delhi at 212. Bombay (227), Kanpur (278), Madras (312) and Kharagpur (349) follow. IITs have slipped a bit since 2008 when the highest ranking IIT was Delhi at 164. Professors at IITs often criticise the QS ranking system since the methodology does not favour standalone tech institutes but the writing on the wall is clear: Brand IIT is under siege. But hope was evident on a recent Wednesday sunny morning on the IIT Delhi campus. The institute was gearing up for the ninth edition of I2Tech, a programme to open up to the public the research it does. "The general public was not aware of the research and innovation happening at IIT. "It is important to reach out and tell people what we are doing," says Mahesh Abegaonkar, Professor of Electronics and Communications, adding that this year he expects more than the 5,000 visitors who turned up in 2012. A small effort at buffing Brand IIT. And, not a day late.